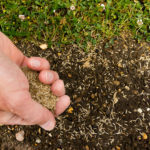 Seeding is the most important part of your lawn care checklist because, without it, you’d have either dirt yard or a patchy mess. Use these tips to set yourself up for success. The two should always go hand-in-hand. Aeration allows air, water, and nutrients to circulate through your lawn by creating small holes in the soil. The small openings create the ideal space for the new grass seeds to root. 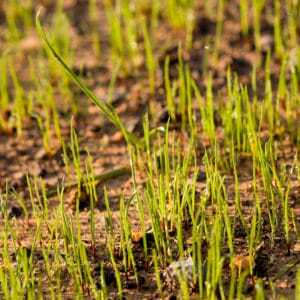 Your lawn will have the best chance to thrive if you aerate and seed in the fall around the first frost. If you’ve already missed this opportunity, overseed in the early spring. 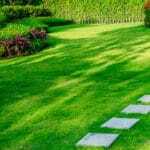 Using the right tools for your green lawn project will give you a better chance for success and will prevent frustration from ensuing. 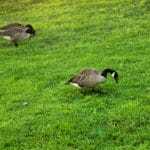 There are a variety of options for aerating including attachments for garden tools you already own, funky shoes with spikes, and a roller you push through your lawn. And for seeding, we recommend getting a proper seeder if you have a big area to cover, but throwing seeds by hand works well for small sections. 5. Call the pros at Green Lawn Fertilizing. 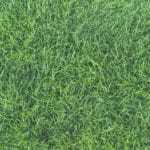 Our Green Lawn program will green up your lawn and get rid of pesky weeds. We’ll take care of the work. All you have to do is call 888-581-5296 and enjoy tending to your lawn once it’s luscious and green.